Check your attitude. If you’re working part-time at a job that you don’t plan to make a career, you might think your attitude doesn’t matter, but it does. The customers you’re rude to today might not come back tomorrow. And if the business has to close, then you’ll be out of job…and there goes the money you depend on for clothes, school, or your car and insurance payments. Cooperate with your boss and coworkers. Offer to help with a project even if "it's not your job." 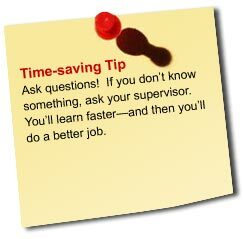 You just might learn something new, and your boss will see that you have initiative. Be polite to everyone, even if they’re rude to you. It’s easier said than done, but you’ll feel better if you just let their bad attitude slide. Be on time. Show consideration for your boss and your coworkers. Click here to learn about all of your rights.